France boasts spectacular scenery and is home to many scenic railway journeys. The ligne de la Côte Bleue (also known as the ligne de Miramas à l’Estaque) is a short 35 minute journey between Marseille and Miramar near Salon-de-Provence. 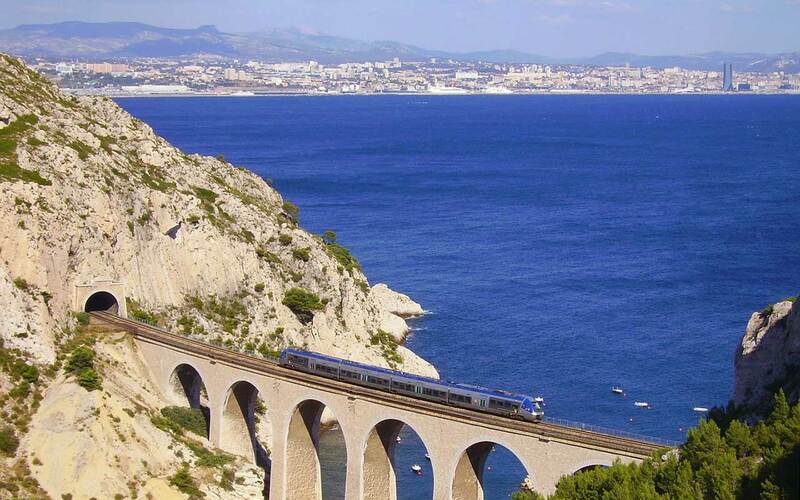 The hourly train offers stunning coastal views and is an easy excursion from Marseille. The train des Merveilles (train of wonders) runs through the hinterland of the Côte d’Azur between Nice and Tende, which is a small mountainous town in Provence close to the Italian border. The Nice–Digne line (also known as the train des Pignes) is the last remaining route of the Chemins de fer de Provence (CP), which once operated an extensive route network in southern France. The 151km line from Nice to Digne les Bains takes 3.5 hours and offers lovely views of the Provencal countryside. During Sundays in summer steam trains operate along this route. Chemins de fer de Provence (CP) is a privately-run railway (owned by Veolia) that is independent of SNCF, which means that Eurail and InterRail rail passes are not valid on this railway. The Chemins de fer de Corse (CFC) train from Ajaccio to Bastia and l’Île-Rousse are among the most scenic routes in France. The 3.5 hour journey from Bastia to Ajaccio connects two coastal cities via Corsica’s mountainous interior crossing several old stone viaducts. The most picturesque spot along the route is when the train leaves Casamozza en route to Ajaccio. Chemins de fer de Corse (CFC) is independently owned, so it is not part of SCNF (although SNCF are contracted to operate rail services). This means that Eurail and InterRail rail passes are not valid on CFC train services. The ligne des Hirondelles between Dole and Saint-Claude in the Bourgogne-Franche-Comté region is also known as the Ligne d’Andelot-en-Montagne à La Cluse. 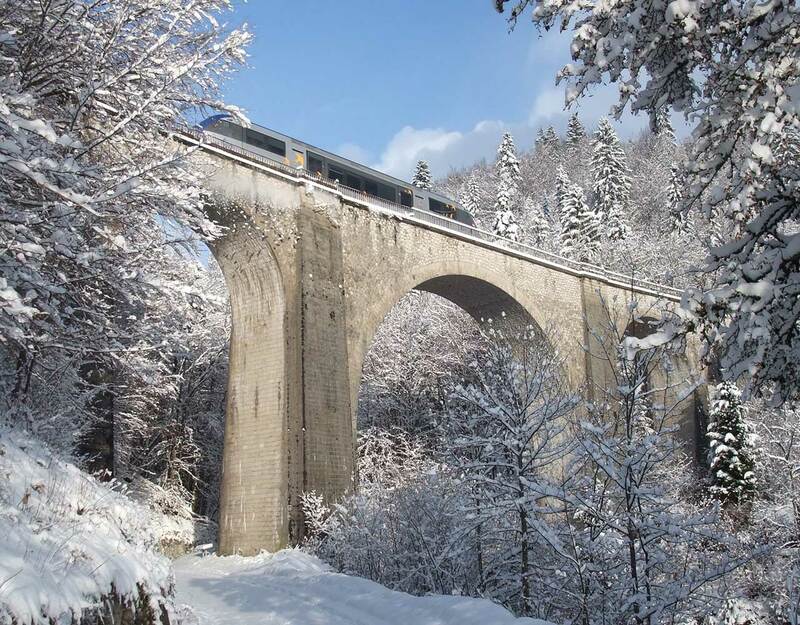 The daily 2.5 hour journey is characterised by the line’s stunning viaducts and the rugged landscape of the Haut Jura. The train de Gorge de l’Allier between Langeac and Langogne. The one and a half hour journey follows the route of the Gorge de l’Allier around midway between Clermont-Ferrand and Montpellier. 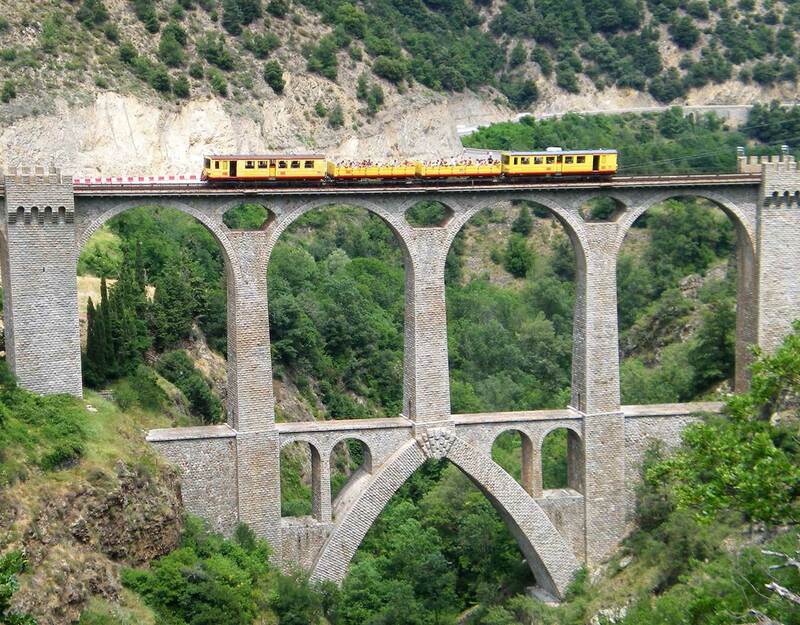 The ligne de Cerdagne/train jaune (yellow train) operates in rural Languedoc-Roussillon-Midi-Pyrénées between Villefranche-de-Conflent and Latour-de-Carol-Enveitg (near the border with Andorra). You can transfer for services to Perpignan at Villefranche-de-Conflent and for Barcelona and Toulouse at Latour-de-Carol-Enveitg. Two types of trains operate on this route, a modern enclosed train as well as an older historic train that sometimes runs with open carraiges when weather allows. Both are painted in distinctive yellow livery reflecting the region’s Catalan heritage.